Treat yourself to the fun-filled vacation of your dreams with a travel package from Gabriel's Travel Agency. Our agents will always go the extra mile to find the perfect travel package just for you. 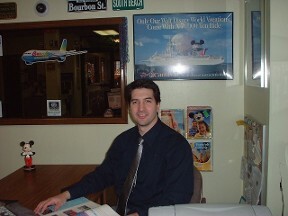 Contact us today to consult with one of our friendly agents about your upcoming vacation. Gabriel's Travel Agency is a full-service, family-owned-and-operated travel agency that has been serving loyal customers for 39 years. We pride ourselves on our ability to offer expert travel guidance, personalized service, and professional advice. Over the years, we have continually enhanced our agency by adding many travel-related services to satisfy our customers' growing needs. Your perfect travel experience is our top priority. Whether you're planning a vacation or trip for yourself, your family, or your business, Gabriel's Travel Agency will handle every detail from your doorstep and back. As travel agents, we love to travel ourselves. This experience in seeing the world allows us to provide you with firsthand knowledge, personal travel tips, and enthusiasm when planning your next getaway. We are a fully licensed travel agency backed by all the necessary credentials. Additionally, we are members of the American Society of Travel Agents (ASTA) and International Air Transport Association Member (IATAN) and are certified travel specialists in Destination weddings, Cruises, Caribbean vacations, and Disney™ travel.